Carlos Henriques, FIFA Referee Development Officer, has called on Nigerian referees to forget about World Cup officiating ambition for now. Henriques gave the advice in an interview with NAN in Abuja on Friday. He advised them to concentrate more on how to secure the Africa Cup of Nations (AFCON) slots. Henriques said that the Nigerian referees needed all the support they could get to earn a World Cup slot. “I think before you start thinking of the World Cup, you have to start thinking of the Africa Cup of Nations. “Let’s start working, thinking to produce referees to represent Nigeria at the continental competitions; that is our main goal. “After they start, and be part of the continental of referees, definitely the chances are there for the World Cup. “They have to wake up like everyone else; everybody has a chance, provided they work hard. They have to work hard, and working hard is not just going out there and work hard. “They have to work hard in all fields, especially in achieving a high level of fitness as well as the way they manage and approach players. 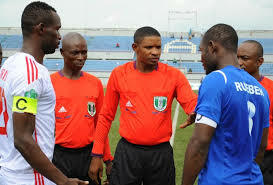 According to him, there are no much challenges that will stop Nigerian referees from achieving this target since they have a very good team of referees’ instructors in the country. He said that the calibre of CAF and NFA referee instructor like Linus Mba, could give the referees all they needed to excel in the job. NAN reports that Henriques, Lim Kee-Chong from Mauritius, a former FIFA referee, and Mark Ephraim Nzengo from Malawi, are the FIFA instructors at the ongoing “FIFA Member Association Elite Referees Course”. The course, which began on May 25 in Abuja, would end on May 29.